This talk will cover the use of digital certificates, their structure, and distribution. The X.509 standard, Certificate Authorities, and PGP certificates will all be discussed. Also the use of certificates will be covered including for web sites, VPNâs, and digitally signing email. Certificate security and known exploits will be briefly mentioned. 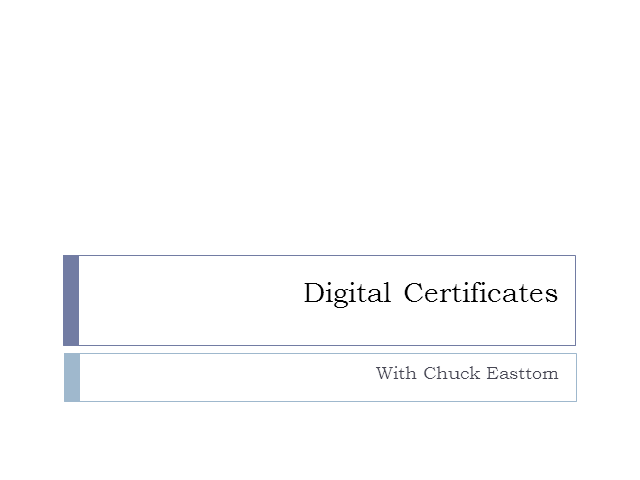 Chuck Easttom has 17+ years of experience in IT and 10 years teaching/training. Author of 13 computer science books including three on computer security. Holds 7 provisional patents (all computer related) and 28 industry certifications including CISSP, ISSAP, CEH, CHFI, and more. He has created the advanced cryptography course for the EC Council and was a subject matter expert involved in the creation of three of CompTIAs certification tests, including Security+.